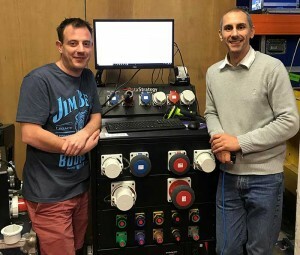 Delivered in June, White Light received the first Data Strategy ‘660’ QC-Check workstation, incorporating the new configuration built for Data Strategy by long-standing partner, Datchet-based SES. The single bay ‘660’ is named for its width and provides significantly more room for test connectors whilst retaining the mobility of a 19” rack format. When Power-Check (the QC-Check distro testing module) is added to the package the 660 workstation provides the ideal solution to a hire company’s power department test requirements. A second notable announcement is the availability of an update for the QC-Check application that adds a significant new feature, multiple ‘inspection sets’. This enhancement to the EUT (Equipment Under Test) test definitions allows QC-Check to intelligently schedule the testing of equipment by defining additional sets of inspection parameters. Additional inspection sets can be added to an existing test definition to provide a different set of inspection requirements with different periods of occurrence. An EUT, for example, might require an electrical inspection on every hire but has the additional requirement of an annual service or calibration. QC-Check keeps track of the EUT’s inspection requirements and flags the user when a test is due. Combined with QC-Check’s built-in reporting facilities, a predictive report can be run to determine what needs testing and when; this allows intelligent scheduling of the appliance test resources while ensuring equipment is always fit for hire. In picture: WL's operational business systems manager Jamie Wells and quality manager Paul Talbot, with the fully integrated 660 QC-Check workstation.